Blog#5 – The Humanities Now! Throughout the last week, we have been playing around with a map of the travel route of Jasper Payne and Christian Froehlich on ArcGIS. The software allows us to add insightful layers to the map, like Native American paths, slave plantations, and several others. Mapping the travel route for this journey has helped me to better visualize how far they actually traveled. As David Bodenhamer states in The Spatial Humanities, “We are inherently spatial beings: we live in a physical world and routinely use spatial concepts of distance and direction to navigate our way through it.” (Bodenhamer 14) Thus, being able to spatially visualize this Moravian journey helps us to better relive their experiences. Mapping their journey also revealed some interesting facts. When I turn on the Native American Paths layer, I can see that the Manocacy Path lines up exactly with the destinations that Payne and Froehlich visited in Pennsylvania. This is very interesting because the Native American trails were some of the only “roads” or ways of travel back then. Once the journey progresses into Maryland, I can turn on the Wagon Map to see how they traveled along the wagon road. When I turn on the Slave Density layer, I can clearly see that they are moving straight into the most dense area. The layer called “Plantations Prior to 1770” shows slave plantations in Maryland and Virginia prior to 1770. Turning this layer on shows that they visited plantations in an area where there were less plantations in one area, whereas there were some areas with big clusters of plantations. I wondered to myself why they would not go to the area where there is a big cluster of plantations to spread the Word of the Lord. Then I turned on the Moravian Itinerant layer which revealed something important to me. This layer shows where there are areas of Moravian preaching and where there are Moravian congregations. Viewing both the Plantation and Itinerant layers together, I realized that those big clusters of plantations were already in an area of occasional Moravian preaching. 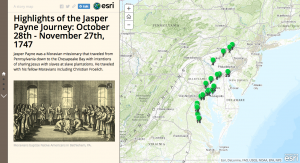 It was clear that Jasper Payne and company were traveling away from areas where active Moravian preaching was occurring. This proves how determined and dedicated they were to spreading the Word to “uninformed” people. Using the Measure tool on ArcGIS I could measure the distances between the points of their daily destinations. I tried to measure the exact path that they took as much as I could. I found that on average they traveled distances ranging from about 10 miles to 18 miles a day. Some days they travel farther than other days. In the beginning they had plans to stay with specific people who they knew, so the locations of their homes may have determined how far they traveled that day. They also tend to stay longer with people who they knew or when there is bad travel weather. As you can tell, there is so much information to be learned from mapping the journey that can’t be learned from just reading the journal. I really liked using GIS for mapping. I agree with Bodenhamer when he says, “GIS provides a way to manage, relate, and query events, as well as to visualize them, that should be attractive to researchers.” (Bodenhamer 22) I think the Map Journal that I made using GIS looks awesome. In my Map Journal I have four slides. I touch on Payne’s journey through Pennsylvania, into slave country, and I talk about why he chooses to go the route that he goes. Click on this image to go to my Map Journal. The most fascinating idea that occurred to me from doing this mapping is that these places still exist today and each of these places has “seen” so many different stories. People a long time ago spoke and wrote about the same places that we talk about today. It’s like Bodenhamer wrote, “[spaces] are not passive settings but the medium for the development of culture.” (Bodenhamer 16) It makes me feel some kind of respect towards these places, such as the ferries, the school house in Oley, the wagon road, and the Native American trails. I want to acquire the knowledge that these places hold. As David J. Bodenhamer wrote in his article, geographic information systems (GIS) have spurred a renewed interest in the influence of geographical space on human behavior and cultural development. GIS provides us a chance to discover relationships of memory, artifact, and experience that exists in a particular place and across time. The multilayered map of Payne and Froehlich’s travel journey we were creating in the past few weeks is one potential of the spatial methods. 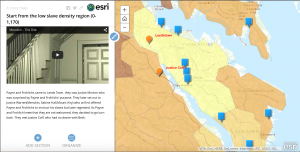 GIS provides tools to display and analyze information geographically. By layering information on top of a map, we can visually represent data in a way that can be readily understood by other non-humanists. It enables me to find out more information with different aspects of the journey and think much more deeply on questions such as how they made their travel decision and both the natural and human environment around the places they traveled. Maps can reveal significant data relationships that are difficult to find otherwise. First, by mapping the travel route of Payne and Froehlich, I have a general idea of the places they traveled and the routing of their journey. After putting the layer of “ Payne Froehlich Travel Journal”, the places they traveled will be shown as red labels with the order of the time they arrived. I noticed that they didn’t travel exactly follow the river and they didn’t follow the way they went through when they returned. Then, the layer of “Moravian Itinerant” shows us that Payne and Froehlich traveled to the places where was the concentrated areas of itinerancy and preaching and I think this might be a factor for Payne and Froehlich to decide their travel route since they wanted to stay with the Moravians and the people they knew. Another fun fact of mapping the journey is that we can use the tool to measure the distance between the places they traveled and figure out the miles they traveled a day. On average, they will travel 20 miles per day on foot and they will slow down if they traveled to a ferry or other unexpected events happened. For example, they stayed at Oley schoolhouse for 3 days because of the rain. Map can be worth thousands of words that it turns into a journey by adding something is contextual. The story points that I have created are the overlaps between the plantations and the places they traveled (http://arcg.is/1cpwWN4). I wanted to discover whether there is a relationship between these two. The using of maps and spatial thinking helps me get out of the zoom of understanding the complex history. It lets me think about the plantations or the places separately and then I can combine them together to have a broad view, which is an easier way for me to comprehend the complexities of history. As Bodenhammer mentions in his article, GIS is a seductive technology, a magic box capable of wondrous feats, and the images it constructs so effortlessly appeal to us in ways more subtle and more powerful than words can. In the past 2 weeks, we paid emphasis on how to use GIS to look for a new understanding this old journal in a spatial way. It’s amazing in the beginning to me since for the first time, I realized that we are capable of working on an old map. I can add footnotes on the walking route of Payne and add signs on the map. I can measure the average distance they walked per day by dividing the days from the length of the whole route through the measure function in GIS technology (474.5/31=15.3 miles). Since they walked all through the journey, 15 mile a day is not bad. And it’s back in 1747. The path they chose is like the Monocracy Path, one of the Indian Paths, and the Great Road. It did limit their traveling speed. What‘s more, they need to get the pass as soon as they arrived the new place and they need to talk with slave to preaching Moravian culture. All this physical elements affected their rate. What else I can do with the GIS technology is that I can add my own layer on the original map. With damaging the old map, we can overlap different map and look for their internal relationships. It’s what we can get through the written records. What mapping the travel route reveals about Payne and Froehlich’s journey is that how they choose this specific route, not that one. And since I’m really curious about this point, I created my own map story on this topic. The process of learning how to use the GIS is really a fresh experience, but it gets even more magical when I create my own map story. When I was creating my own map story, I got a deeper understanding “Spaces are not simply the setting for historical action but are a significant product and determinant of change.” My map story talks about how they finally chose the route. The reason is quite complicated when we related Payne’s journal to Moravian Itinerant, Slaves, Plantation in Maryland and Virginia, Native American Paths, and other historical reasons. In this case, the function is marvelously significant when we create map layers. They started from Bethlehem in Monocracy Path. They changed direction when they arrived Lancaster. It’s because along the Susquehanna River live many Native Americans and there are also many colonial ferries. After they crossed the Susquehanna River and got into Maryland, wherever they stopped and lay at is never far from plantations. They started their journey from those concentrated areas of itinerancy and preaching in Pennsylvania and tried to bring Moravian culture to occasional areas of itinerancy and preaching in Maryland and Virginia. 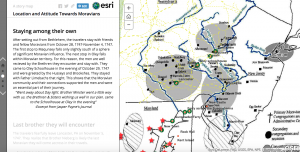 Furthermore, as Bodenhammer said “deep maps…..are genuinely multimedia and multilayered”, we can use different composition of different maps to find new relationship between elements, like slaves, plantation and Moravian. As the history is complicated and different matters happened in different place at the same time. The multilayered maps give us a objective view what is going on. The following is the screenshot of the slides of my map story. The work of mapping the travel route of Payne and Froehlich with GIS is a work of close reading. One feature of GIS, which is different from the digital humanity techniques we had before, is that GIS provides variant data. These data are not only from the the travel of Payne and Froehlich but also from other historical events and characteristics of the region, such as the plantations, the Native American paths and the slave density. As Bodenhamer says “We see space as the platform for multiplicity, a realm where all perspectives are particular and dependent upon experiences unique to an individual, a community, or a period of time.” (The Spatial Humanities Bodenhamer)These data shows different aspects of the same area, by which we can explore its history and the interconnection of different events. The data provided through GIS play important roles in exploring deeply the travel route of Payne and Froehlich. When we are mapping the travel route of Payne and Froehlich’s journey and comparing it with the data from other events in this area, we can easily figure out how Payne and Froehlich plan their route. The purpose of the travel of the Moravians is to preach their religion to the slaves—to let them know God, and how God loves them. Therefore, I put the “slaves-1800” layer on the GIS map. GIS “manages large data sets” of slave density and “visualize the results of spatial analysis” (The Spatial Humanities Bodenhamer)by dividing places into regions with borders of different densities. It shows that the travel route follows a trend that starts from the place with low density of slaves to the place with high density of slaves. Also, the amount of colonial plantations follows the slave density—the higher the density of slaves, the more plantations in the place. There are several times that Payne mentions in the diary that they see the justice and see the slaves and the places they see the slaves are near or at the plantation. The GIS map also shows that part of their journey follows the Native American path. By GIS mapping, I also find out that the average distance they travel each day is 20 miles. When mapping their route, I find out more information than by simply read the diary. From the reading, we know the purpose of the journey, but we do not know how they choose their path, and why they choose one place instead of another. The article mentioned that they finally stopped at Justice Coff’s place and go back, which means if people were not against their plan at justice Warren’s place, they could have continued their journey. 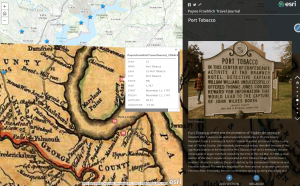 So, by exploring the plantation places in the map, I find out some potential “targets” for Payne and Froehlich—one route towards The Anchorage plantation or another route towards White House plantation in New Kent. When I am creating my storymap, I focus on how they choose their route and what could influence their journey. Just as I mentioned before, their preference follows the slave density and the plantations. Also, people, including the Justices, have important influence on their decisions. At first, for example, one Justice is against their plan which caused them to be more eager to complete their mission, and later Justice Warren stopped them from continuing their journey. “Its unparalleled ability to manage and visualize data within a spatial context has led to a rediscovery of the power of map.”(The Spatial Humanities Bodenhamer). GIS map puts informations from different resources in a map, helping us to explore different events and characteristics at the same time. By doing this, we can find out the connection between these events and have deep understanding of the region.